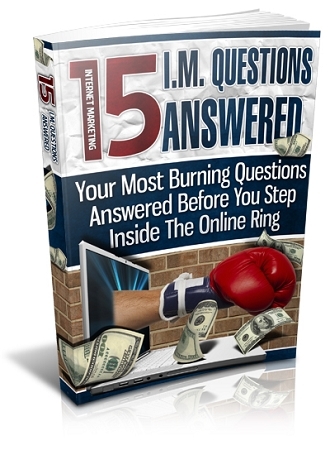 This newly released book called "15 Marketing Questions" is the quickest and easiest way to bypass the hurdles that cause 99% of people to either get dismal results or fail completely online. Inside this incredible work you'll receive extensive and highly detailed answers with action steps you can take to the top 15 questions that frustrate, annoy and have been recognized as the specific areas that cause struggles. Absolutely everything any business owner or entrepreneur would need. I've already tried online marketing. Why didn't it work? I don't have my own product. What can I sell? I'm worried that I won't succeed, what do I do? What are JV's and how can I score one? I just want to promote affiliate programs, but how? Easy ways to leverage the traffic of others and increase sales overnight! As you can see this really is the ultimate collection of answers for marketing your business online. (Even if you have already dabbled online, have a website and an email list you'll benefit immensely from the additional secrets.) This book provides the top steps to the questions that we get asked the most. Learn everything from resource building to earning an income online from your businesses, as well asattracting visitors and squeezing every cent from them, to specific reasons why some succeed and some don't. You'd be hard pressed to find another resource as extensive as this, that offers proven strategies that you can apply immediatelyto skyrocket your business.